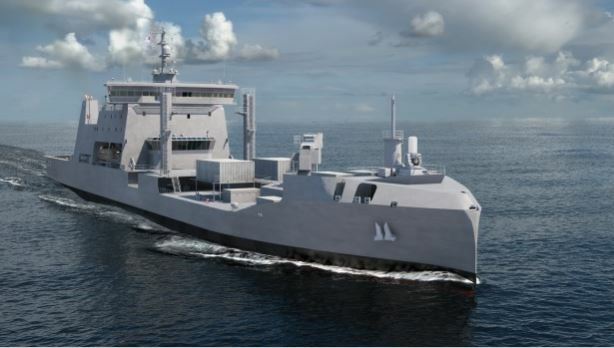 Here is an artist impression of the new ship HMNZS AOTEAROA which will be delivered in 2020. The ship has a displacement of 24,000 tonnes and cost $498 million dollars. It is 173 metres long and as a design speed of 16 knots. Accommodation for 98 persons. The vessel will be built by Hyundai Heavy Industries. Well let’s hope they manage this project better than Protector and deliver it on time and up to specification. Canterbury was supposed to be able to go to the ice, but it is not safe for it to do so. Probably the same idiot who decided to send Hawea to Fiji for six months leaving NZ’s EEZ to be patrolled by whatever. It depends how many cap tallies they got left in stores! There are quite a few ferry and cargo vessels around Europe and the Mediterranean that have the familiar “Canterbury look”. I should imagine the Southern Ocean would be off limits to such vessels. It was bad enough in the old days on F625 Rotoiti “Rockin n Rollin” 60º S doing SAR duties. One of Kim Jong-un misguided missiles might make a “king-hit” …. embarrassing!